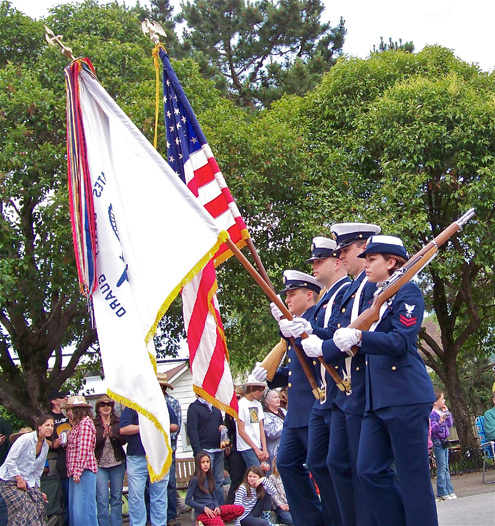 The sun shone Sunday on the Western Weekend parade in Point Reyes Station. Despite a week of off-and-on rain leading up to the parade, the weather was sunny and warm. Receiving applause all along the main street, a Coast Guard color guard headed up the parade. Western Weekend queen Alyssa Tanner (left) and princess Jessica Arndt together made a second trip down the three-block-long parade route after riding in separate vehicles at the start of the parade. At the wheel of the 1936 Ford Phaeton is owner Jon Langdon of Inverness. El Radio Fantastique sponsored by Vladimir’s Restaurant in Inverness won the grand prize trophy. 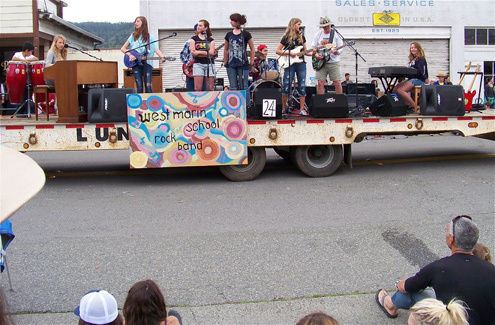 Riding on a lowboy trailer pulled by a truck, the band led by Giovanni DeMorenti (in red) performed New Orleans-style jazz and blues. 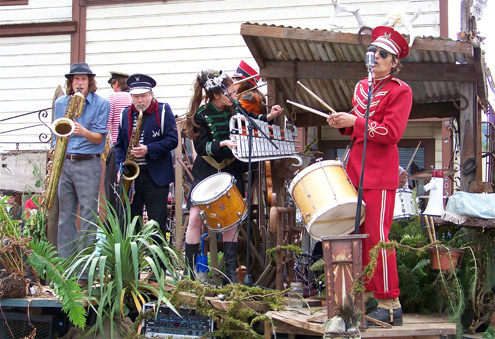 El Radio Fantastique also won a trophy and a first-place ribbon in the adult music category. 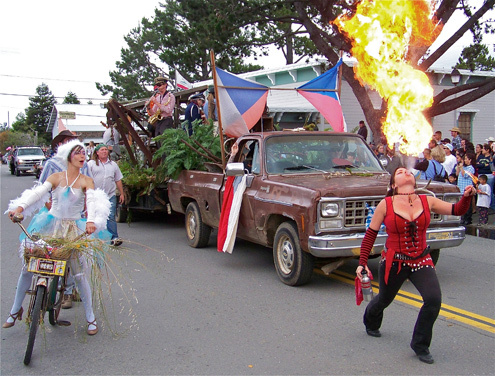 Marching ahead of the band was fire-eater Bonnie Porter. Circling the float on bicycles were a pair of winged fairies, including Miss June at left. 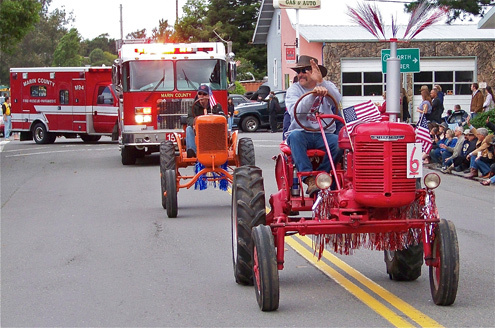 Pete Tomasetti Tractors won the first-place ribbon in the Farm Vehicle division. The orange tractor was built in 1938, the red one in 1941. 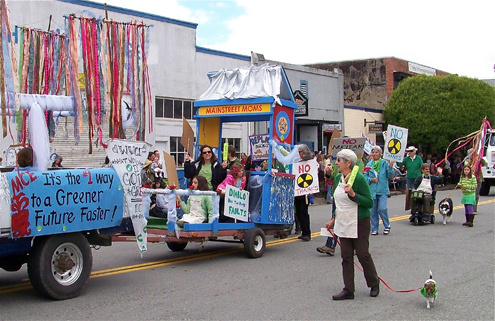 The first-place ribbon and a trophy in the adult-street-show division went to the Mainstreet Moms, who oppose nuclear development. 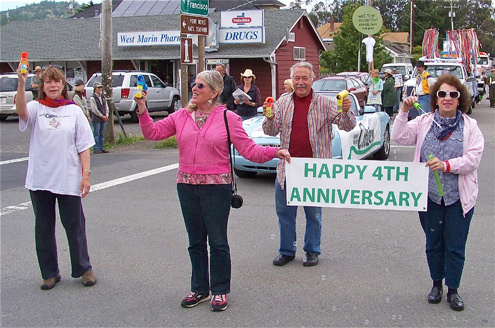 The West Marin Citizen’s entry celebrated the weekly newspaper’s fourth anniversary. The Aztec Dancers won a second-place ribbon in the best-drill-team judging. 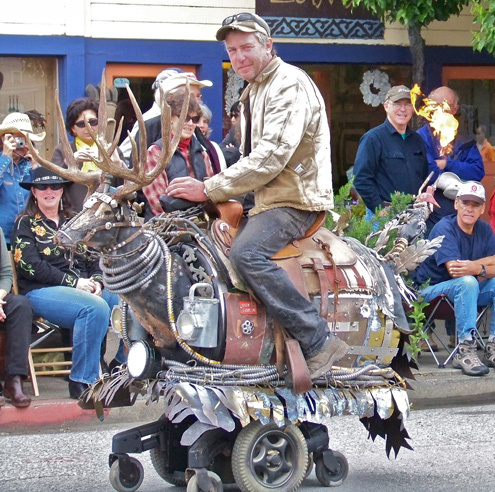 For his parade entry, Jason McLean built and rode a deer with fire belching from its tail. 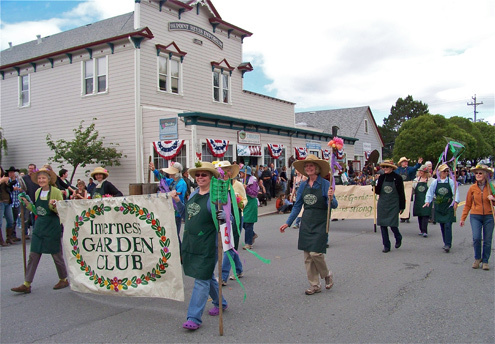 Taking the second-place ribbon in adult street shows was the Inverness Garden Club. 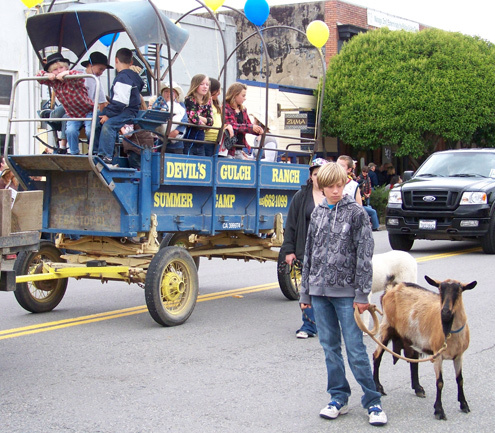 Escorted by two goats, Violet (wearing brown) and Avie (in a white-and-black wool coat), Devil’s Gulch Ranch Camp in Nicasio won a first place ribbon in the kids’ animal competition and a trophy in the adult-animal judging. The ever-popular Nave Patrola won a trophy and first-place ribbon in the best-drill-team judging. 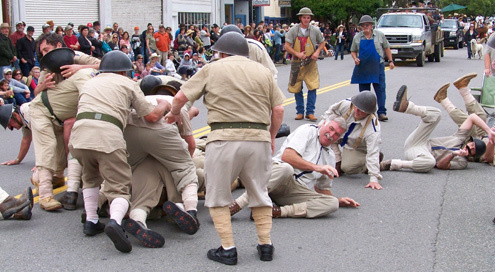 The group spoofs the Italian army in World War I. 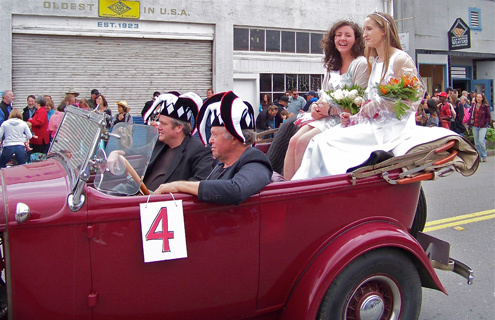 Although the Italian consulate in San Francisco back in the 1970s complained that their bumbling antics denigrate Italians, the Nave Patrola, which includes several members of Italian descent, has continued to take part in the parade every year. 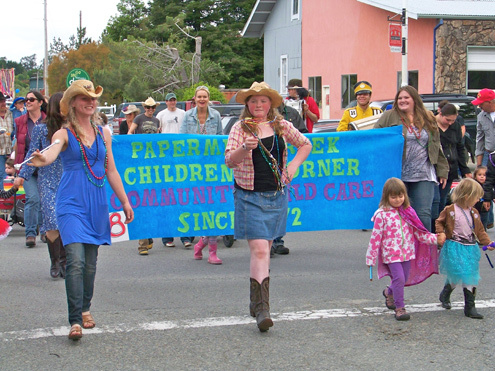 Papermill Creek Children’s Corner preschool won the first-place ribbon in the kids’ drill team category. Taking the first-place ribbon in kids’ music were 7th and 8th graders from West Marin School. The 6th graders won the second-place ribbon. 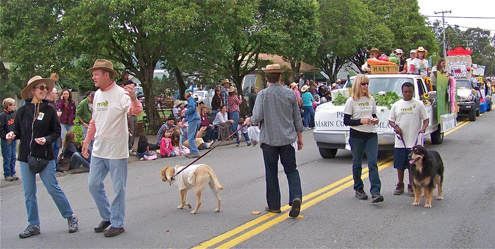 County Supervisor Steve Kinsey (second from left in foreground) led the Marin Agricultural Land Trust (MALT) float, which took the first-place ribbon for an adult float. The trophy plus a first-place ribbon in the kids’ float judging went to the 4-H Bake Sale float. 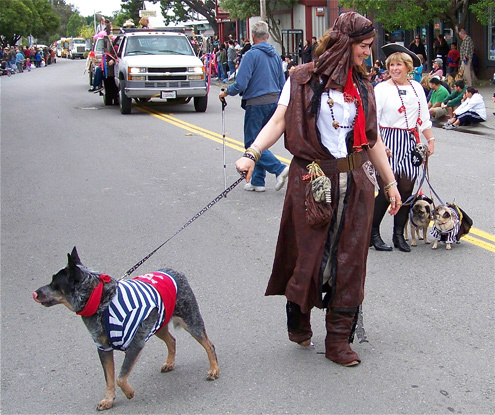 Pirates and Crew with Carol Rossi received a first-palace ribbon in the adult-animal division. 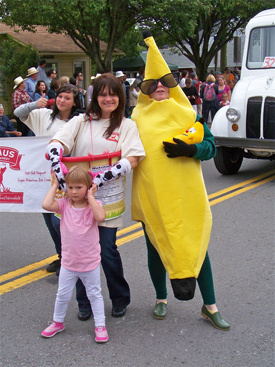 Straus Family Creamery in Marshall used the parade to promote its new banana-flavored ice cream, passing out free samples to spectators along the parade route. The Staus entry won a third-place ribbon in the adult vehicle category. 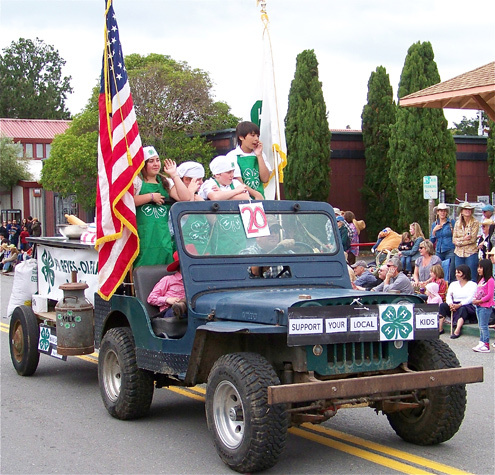 The judges for this year’s Western Weekend parade were Matt Murphy, Carol Friedman, Laurie Monserrat, and Kristi Edwards. Robert Cardwell, as always, was the announcer at the judges’ stand in front of Toby’s Feed Barn. 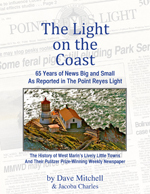 Winning entries can pick up ribbons and trophies at The West Marin Citizen office on Fourth Street in Point Reyes Station. It must have been that ornery possum. I suppose it’s possible that the hacker who broke into my computer was a possum. A few weeks ago I had one break into my garbage can. Sparsely Sage and Timely is powered by	WordPress 4.9.10 and delivered to you in 0.697 seconds using 56 queries.